CREATE Fertility are the UK’s no.1 Natural IVF & Mild IVF specialists. We provide female-friendly IVF treatment that delivers better health outcomes for mothers and babies. Our pioneering approach to IVF focuses on the quality of eggs, rather than quantity. Our vision is to promote gentler fertility treatment which offers women the best chance of success and reduces the emotional, physical and financial burden associated with IVF. At CREATE Fertility our natural approach to IVF treatment means fewer drugs and injections, fewer side-effects and reduced treatment duration; making treatment more female-friendly and less stressful. The strength of CREATE Fertility lies in our expertise and experience. 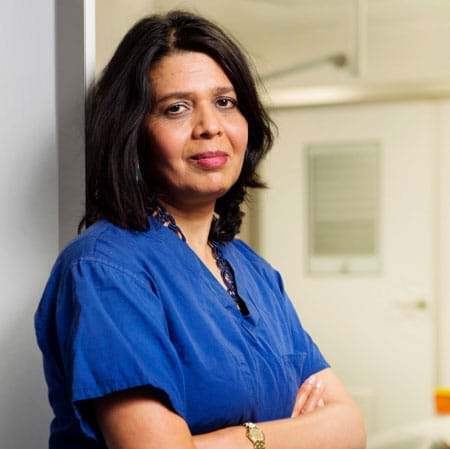 Our fertility specialists are led by Professor Geeta Nargund, a pioneer and expert in Natural and Mild IVF, with Professor Stuart Campbell, one of the foremost pioneers of obstetric and gynaecological scanning as the Director of Ultrasound. Professor Nargund is the award winning Medical Director of CREATE Fertility and also a Senior Consultant Gynaecologist and Lead Consultant for Reproductive Medicine services at St George’s Hospital, London. Professor Nargund has published more than 100 peer-reviewed scientific papers including abstracts and also several book chapters in the field of reproductive medicine. She is a pioneer in the field of Natural and Mild IVF and Advanced Ultrasound Technology in Reproductive Medicine. Dr Adrija Kumar Datta graduated from the University of Calcutta, India and obtained an MD research degree in Obstetrics and Gynaecology from the same University. He became a Member of the Royal College of Obstetricians and Gynaecologists (MRCOG) in 2005 and subsequently became a Fellow of the College (FRCOG) in 2017. As a trainee, Dr Datta acquired advanced skills in Reproductive Endocrinology, Subfertility and Assisted Conception from St. Bartholomew’s Hospital, London. He continued practicing as a fertility specialist, alongside mainstream Obstetrics and Gynaecology until the completion of his training in the UK. Dr Datta joined CREATE as a consultant in April 2015 and worked in both sites of CREATE fertility in London, before he moved to its Birmingham Centre. Dr Datta is a member of the British Fertility Society (BFS), the European Society of Human Reproduction and Embryology (ESHRE), the American Society of Reproductive Medicine (ASRM) and the International Society for Mild Approaches in Assisted Reproduction (ISMAAR). He has an avid interest in academia. Before moving to the UK, he was a lecturer in Manipal College of Medical Sciences in Nepal. His research papers have been published in reputed journals. He has written chapters in books and has presented in many International Conferences. His main area of interest is ‘ovarian stimulation’. Dr Datta is an instructor for ‘Transvaginal Ultrasound Course’. He was invited to speak on ‘Pelvic Ultrasound’ and ‘Medical Statistics’ and ‘Natural cycle IVF’ by different academic centres in India. In his spare time Dr Datta enjoys being an amateur photographer. He can also speak in Hindi, Urdu, Nepali and Bengali. Attracted by the idea of ‘Mild approach IVF’ and ‘patient-centred’ Assisted Conception, Dr Datta joined ISMAAR. As an active member of the CREATE group, he practices on this principle and explores it further through research. Charline is an IVF Consultant and Subspecialist in Reproductive Medicine & Surgery. She qualified in Obstetric & Gynaecology in 2009. She has undertaken specialist training in fertility and has been an accredited Subspecialist in Reproductive Medicine & Surgery in Paris since 2010. On the specialist register in the UK since 2011, she is an active NHS Fertility Specialist at St. Michael’s Hospital, for subfertility investigations, management, treatment, recurrent miscarriages investigations and management, assisted conception and reproductive surgery as diagnostic & operative hysteroscopy. She is a member of the British Fertility Society and also teaches medical students at St Michael’s Hospital and at the MSc in reproduction and development at the University of Bristol. Charline is thrilled to join the CREATE Fertility Team and to bring for patients in Bristol a different approach of assisted conception: a safe, innovative and patient friendly approach focused on quality where patients are looked after. Dr Alka Bhide has more than 20 years experience in fertility and assisted reproduction. She has extensive experience in all aspects of Fertility and reproductive medicine, with a special interest in the IVF, egg-sharing and gamete donation programmes. She obtained her medical degree in 1985 and went on to start her initial training in Obstetrics and Gynaecology, in India. Dr Alka moved to the UK in 1989 to continue higher training in Obstetrics and Gynaecology, and she then trained in assisted conception. After completing her higher training, she went on to work for the NHS in 1996. She has worked at a number of different private Centres since and was the lead fertility consultant for Cambridge Centre and Essex Centre. She joined CREATE Fertility as Fertility Consultant in November 2017 and is proud to be part of a clinic that has pioneered a more natural approach focusing on the quality of women’s eggs, not the quantity. At CREATE, we have achieved excellent success rates combined with an excellent safety record as a result of our tailored Natural and Mild IVF treatments. Prof Nargund discusses why infertility is rising?